Amy is a good friend of mine from when Mike and I lived in Ft. Lauderdale a few years ago. We met at Young at Art Children’s Museum, where we both worked as museum educators. We had a lot of fun that year as I was getting used to married life and Amy was living the single life. But she didn’t stay that way for long! I remember the weekend that Amy met Rollo. She came into work on Monday talking about the wedding that she had been to and the man that she spent all night talking to. She also caught the bouquet that night but failed to mention this until later on (if that’s not a foreshadow, I don’t know what is). As she got to know Rollo over the next several months, she seemed to be smitten with this brilliant musician. Their similar interests, compatible personalities, and genuine love for each other (and oddities) was a recipe for lifelong bliss. I was thrilled to hear the good news of their engagement only a few months later. They ended up having a beautiful southern Florida wedding right around Christmastime last year and have been living in New York ever since! 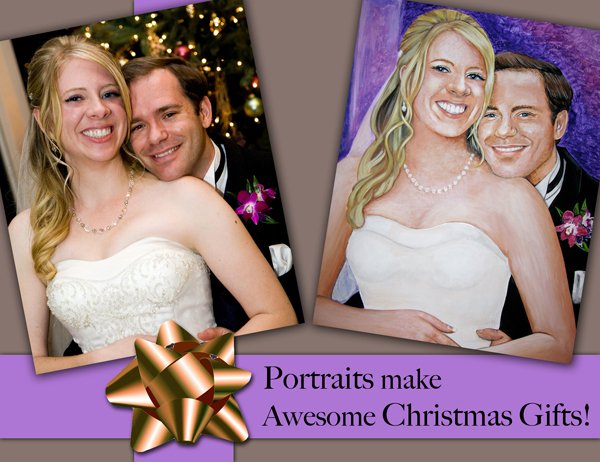 Ok, you have one guess to what their wedding gift was supposed to be…you’re right, a portrait! Better late than never, right? I’m sorry guys, this has been a very busy year for us, but now it can be an anniversary/Christmas gift…see, we meant to do that! Anyway, we love you and wish you many years of love, happiness, and laughter and hope this helps you remember the beauty and joy of that special day when the two of you became one! *For portrait pricing, please contact me at sybilalfano@mac.com.